Hey, I just managed to finish this little work. NOTE: Not all bugs were fixed since some of them would ruin the gameplay, etc. NOTE 2: If you still find something unusual in the game (leftover bug or something else), let me know. Only constructive criticism allowed. If you have negative, do that constructively! I'll definitely try this out when I can! Wishing it could be now but I'm using mobile only. I don't think changing "Keen hops across Bloogwaters Cossing" to "Keen hops across the Bloogwaters Crossing" was necessary. But since English is only my second language, it would be nice to get somebody else to comment on that. I don't like the "Id" logo you created for the intro. I would have just kept the original, since that was the same logo as in Keen 1-3 and even the yellow/blue "Id" logo in the help texts of Keen 4-5 and Wolf3D had the same style (capital "I" with a slightly smaller, but still capital "D"). If I would have changed it at all, I would have made it look like the current "id" logo. I have no idea why you decided to make most the tiles above the domes fully blocking and add tons of deadly orbs next to the blocking tiles. Why? WHY!? It looks ugly, especially that wall of death on the right side of the second dome. It makes the level look like a badly designed game level instead of an actual organic building on an alien planet. Is that really what you wanted to achieve? I'm not sure how much you actually changed, but slapping that "Copyright 2019 Szemigi (v1.6)" onto the startup screen is ridiculous. If I fix the few things mentioned above and re-re-release this as v1.7 do I get to slap "Copyright 2019 K1n9_Duk3" on the startup screen as well? Seriously, I think the startup screen should say "UNOFFICIAL Version 1.6" instead of that copyright nonsense. The "the" should definitely not be there; it was correct the way it was. Thanks. I just didn't want to change in favour of the original game, but I'll change it to make it better and like I said again, thanks. Well, didn't know myself either that the "the" is not necessary. Somehow I felt it sounds wrong. Nevermind. Besides, I tell you in hungarian we would use that, but that's irrelevant in this theme. The problem is I didn't know which is the current design nowadays? "id", "ID", or "Id"? But thanks to your answer, I know what to do. Well, it is because I changed the tile property of the dome edge tiles to fully blocking to fix the bug that leads player to complete the level without using the gems. And after changing them to fully blocked, on some part of the dome edge tiles it was like Keen can walk on the "air" (the part of the blocked tile). So I achieved bugfixing, if you get this method. But if you really wanna fix this dome thing, jump in and fix it together. I can add UNOFFICIAL, no problem. I wouldn't call this ridiculous, it just doesn't fit since it's really unofficial (I say after all, too). That's all. After all, we could say version 1.7 that was made by me and you, K1n9_Duk3. Do you agree with fixing other things with me? I wasn't intending to mock you, I just thought it was a funny mistake. Everyone makes typos and spelling mistakes sometimes. It sounded like that for the first time. Nevermind. EDIT: In the meantime, I changed my mind, so there won't be version 1.7. And as for you, K1n9_Duk3, I say you should learn to respect what I made instead of nitpicking. Good? And sorry, but after all my unofficial version 1.6 load screen is pretty good, so no, no version 1.7 by you. I have tried to get Keen 10 working and it requires keen6 exe and i have tried many sites and tried to download the full game. I got a working copy of keen 6 but using its exe doesn't work with this patch thingy and keen 10. And when I use the exe on Keen 10, it is just messed up, how can I fix this? Thanks in advance! 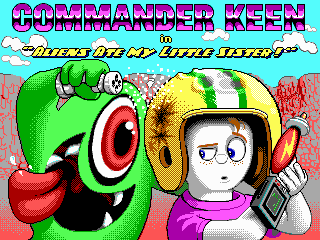 And if I need to have some legit keen 6 version, where can I get this? Use Keen 6 v1.4 + decompress KEEN6.EXE with UNLZEXE.